burst different crackers all day long without any inhibition and for that I would get up even at three in the morning but nobody will be awake so I will be forced to sleep and at five my mom would apply some oil(gingelly)to my head (a custom followed during diwali) and she asks me to fire crackers then I will take a shower again will again fire crackers all day long along with lots of sweets and snacks. This was the routine for years all through my child hood and they are great unforgettable childhood memories!of-course every one would have experienced same kind of pleasurable diwali celebration memories of their own.Some homes make their own sweets and snacks but some pre-order from caterers either way without sweets and snacks there is no diwali.I have listed some sweets and snacks to try for this diwali. 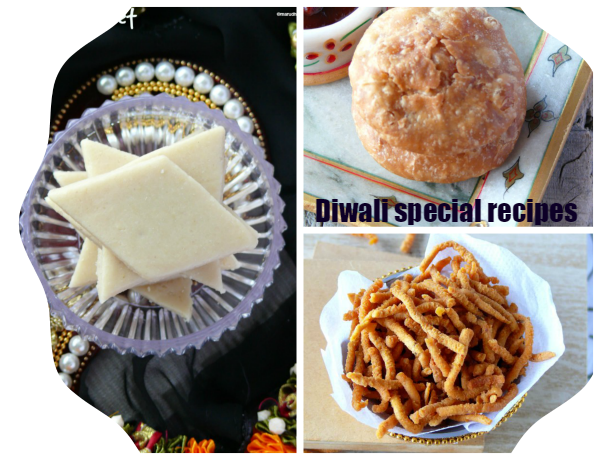 Top 10 Best Selling Diwali Gift Hampers!! Lovely collection, Vani. Loved all the sweet and savory dishes.